Clever storage and good-looking display space. 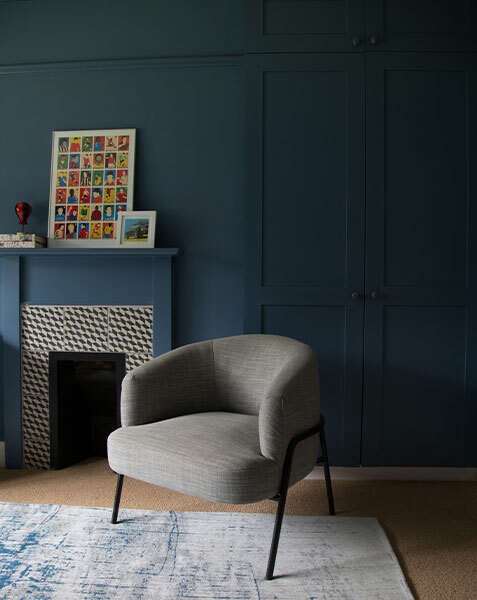 Bespoke cabinets are not automatically at the top of everyone’s wish list, but don’t overlook the dramatic impact they can have on your home. 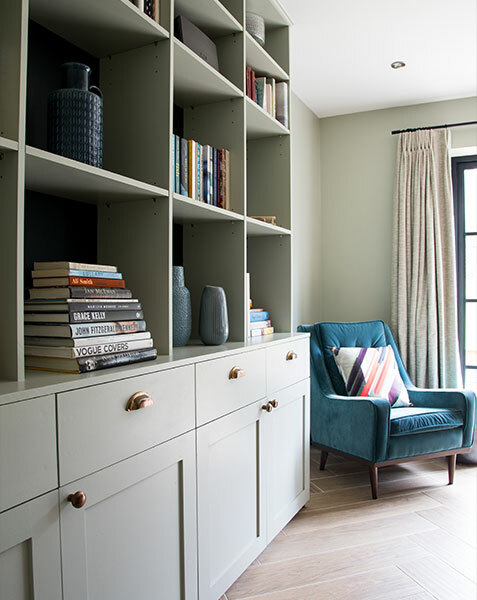 There are few rooms in the house that won’t benefit from a little custom built joinery; whether it’s a couple of book shelves in an alcove, some handy cupboards in the boot room or a fully fitted walk-in wardrobe. 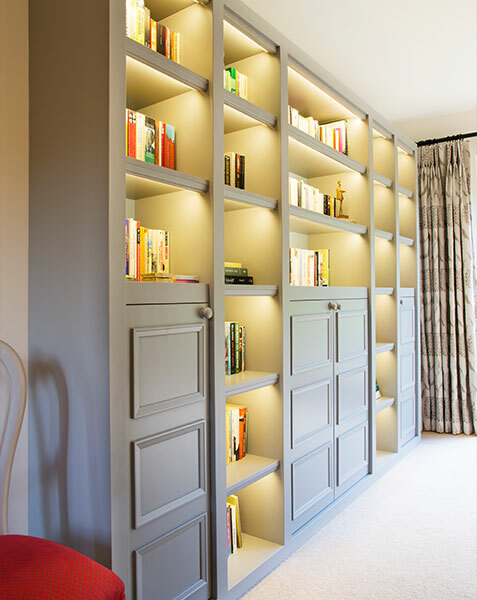 Bespoke cabinetry can be used to display, store, organise and access your belongings more easily. 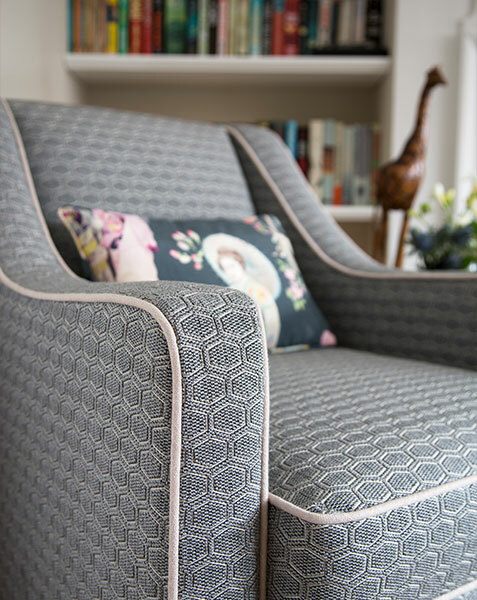 It makes maximum use of all areas available, creating a sense of additional space and calm throughout the home. 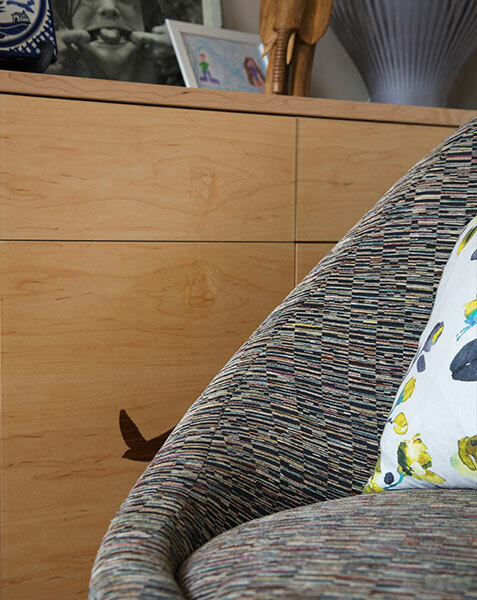 Our approach to designing the perfect cabinets for your home is as intuitive as all our work. The holistic approach means that they have to not only look great but work brilliantly too. We start by looking at what you own and how you live, and then design bespoke cabinets, shelves or storage that will make life easier. Back door clutter, out of control book collections, overflowing kitchen counters or wardrobes busting at the seams can all be taken in hand to make the everyday run more smoothly. 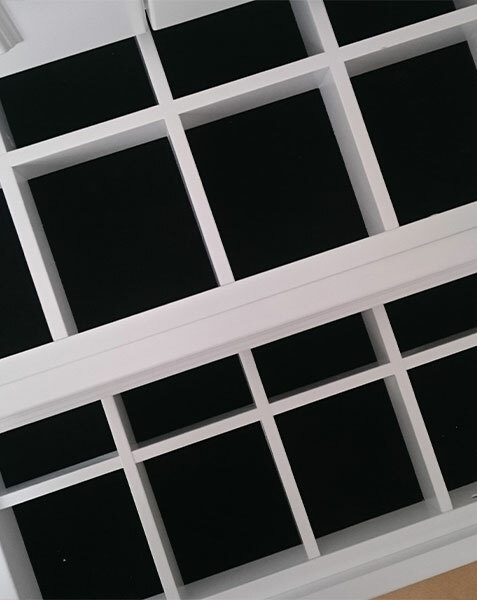 Anything is possible with bespoke cabinets: painted, high gloss, wood-grain, or even coloured perspex: the sky is the limit and the finish will be designed to complement your room scheme and your style. 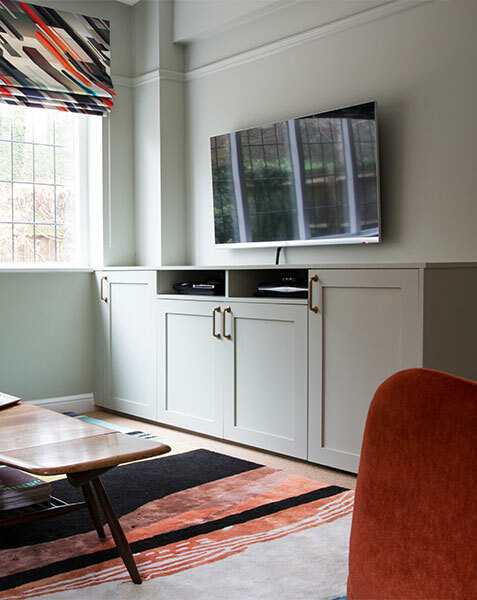 Bespoke cabinets put the things you love on display, and things you need within easy reach. Have a look below at just a few of the clever design features that can make all the difference. A bespoke cabinet is a real feature in an open plan kitchen. 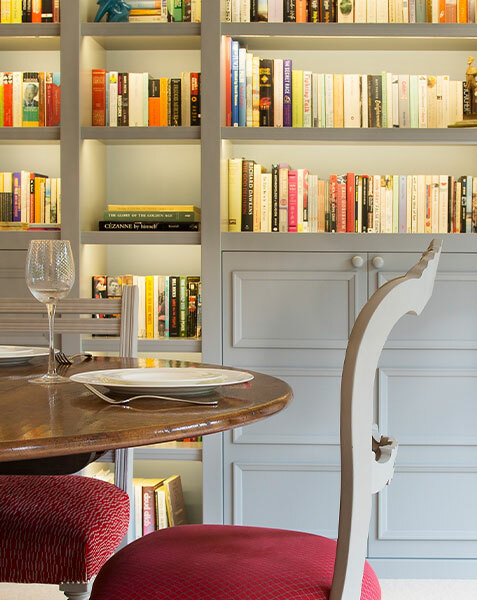 Shelves displaying favourite books and objects bring warmth and personality to a family space, and provide bags of cupboard space for storing occasional crockery and kitchen equipment. In this kitchen we designed a unit to reach from floor to ceiling to maximize the storage and the feeling of space (note: stopping short of the ceiling can make it feel lower). Painting the units in the same colour as the walls created a harmonious effect, and the darker recesses frame the objects on display. 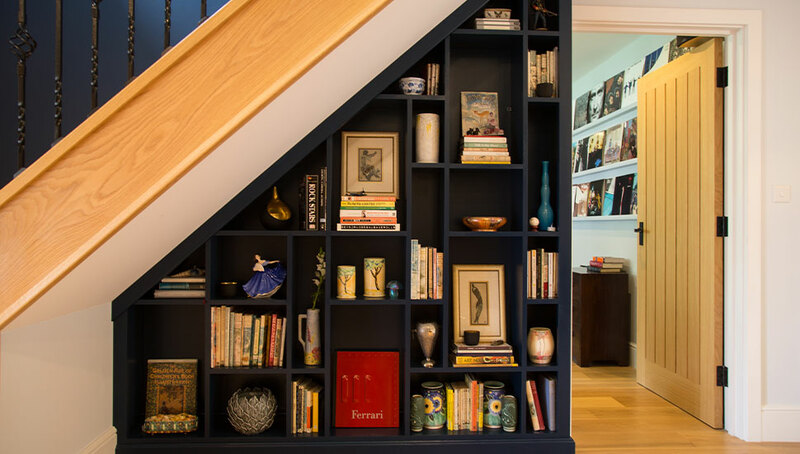 Here we used bespoke cabinetry to create a good-looking feature in a tricky space under the stairs. 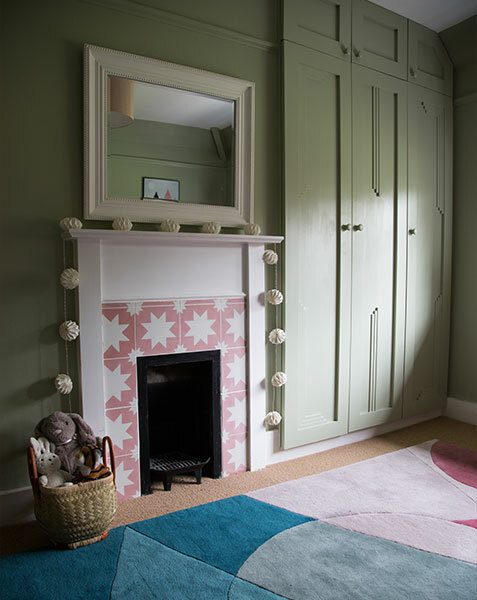 Look through the door into the study and you’ll see a favourite collection of vinyl records has been transformed into artwork with some simple rails. Alcove shelves are a simple way to use a small space and rows of books have a wonderful way of adding warmth and character to a room. 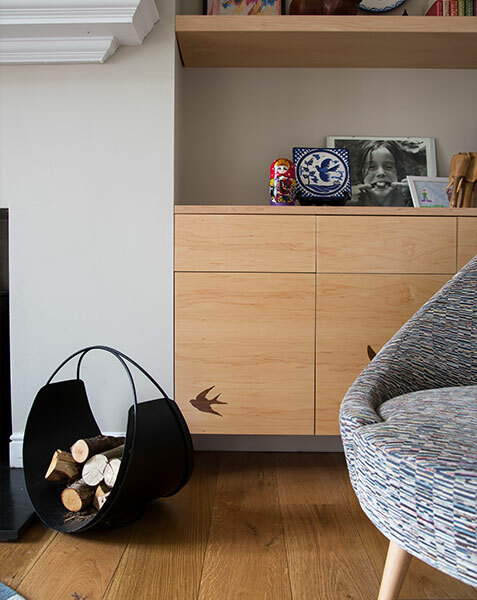 Swallows in flight swoop across this bespoke alcove unit. Made in maple with an inlay design of dark wood, this one of a kind floating cabinet is truly personal. 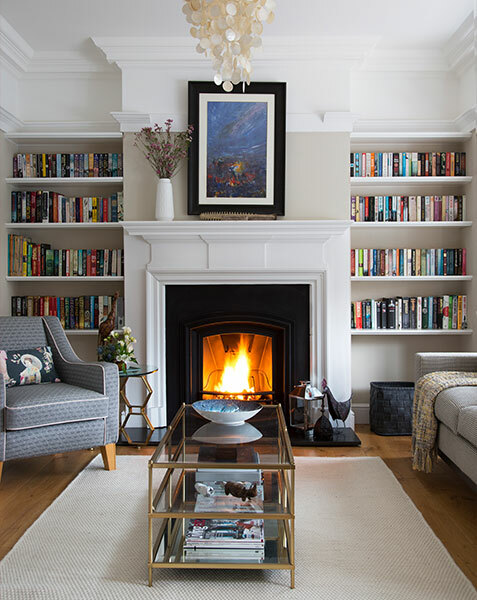 Elegant bookcases in this sitting room feature soft integrated lighting. This is a beautiful way to add atmosphere and to balance the lighting in the room, especially if the cabinets run the whole length of the wall as in this case. Small details like this can really elevate your design. Perhaps the most fun place to play around with possibilities is in the wardrobe; it’s time to get really personal. The design will depend heavily on many factors, for example the type of clothes you wear (suits vs Sweaty Betty? ), the sheer volume of shoes and bags you own, your preference for folding or hanging and even your height. 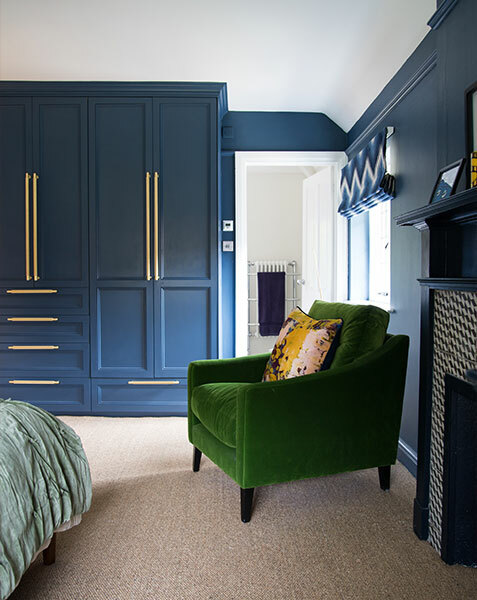 Your wardrobes can feature pull down rails, drawers, and bespoke compartments in every shape and size for collections of accessories or undies. 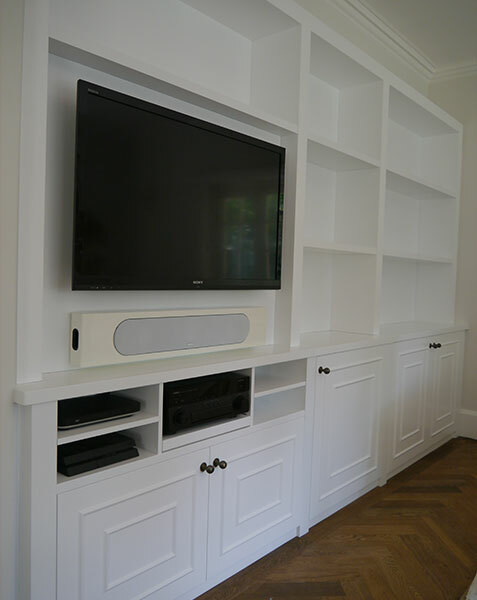 An essential way to accommodate TV and other entertainment systems for maximum viewing and listening pleasure, creating a fun space for the whole family to enjoy together. 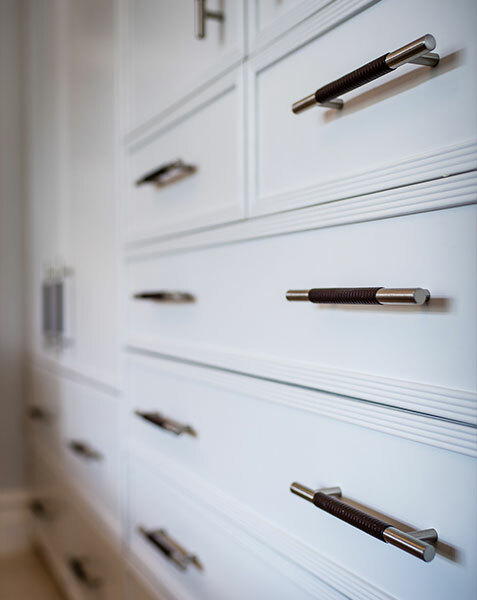 Handles are the jewellery of any cabinet, and offer myriad ways to change the style of your units. 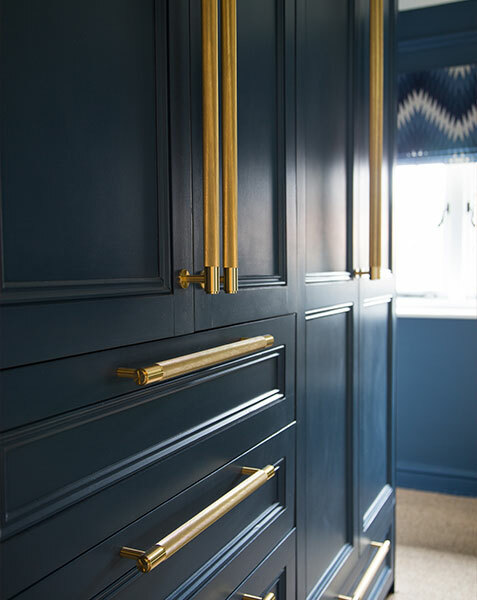 Here an elegant painted door has been given the full glamour treatment with deco style brass handles with a brushed finish. 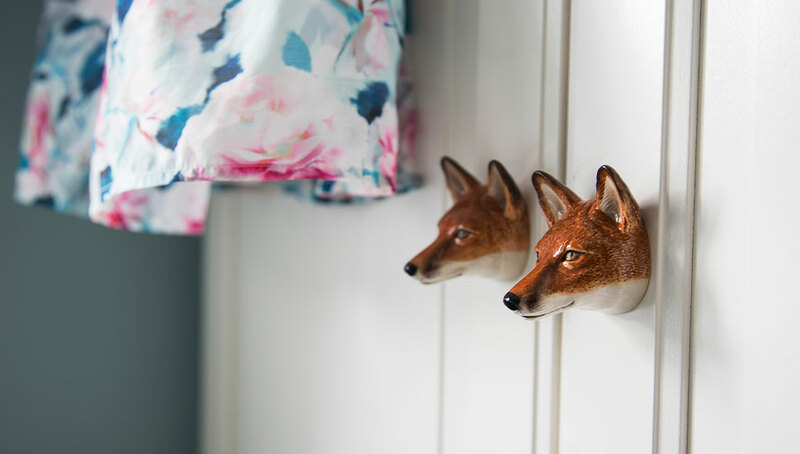 Below, a pair of cheeky ceramic foxes add a playful touch to a child’s wardrobe. Request our online services and price guide.